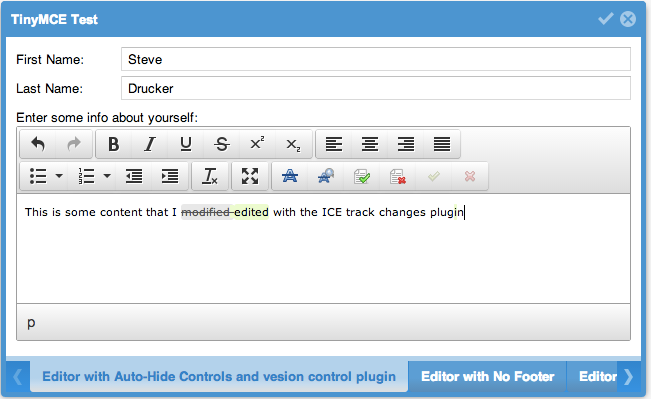 Integrating Ext JS 4 and the TinyMCE 4 Rich Text WYSIWYG Editor | Druck-I.T. I build great big things for the web. 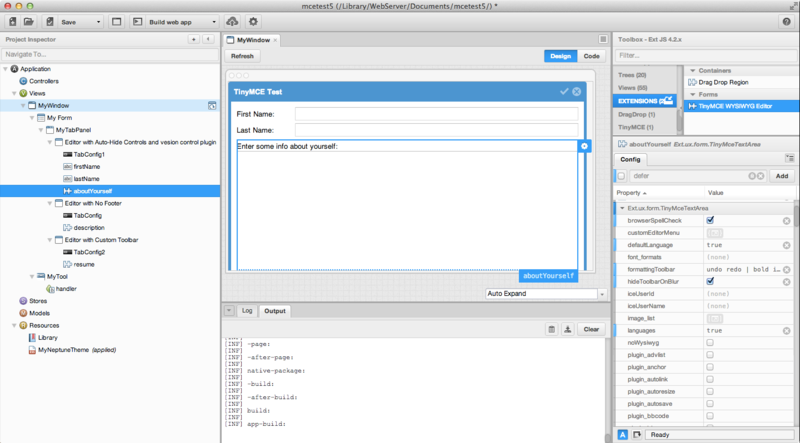 TinyMCE is generally considered to be one of the best WYSIWYG browser-based editors that’s currently available. Not only does it have a ton of native features, but it also has an extensible plugin architecture that enables developers to add additional functionality with relative. One of it’s best features is the ability for a user to expand the editor to full-screen, thereby enabling a much better user experience. It also has a copy/paste plugin that can filter out nasty extraneous Microsoft Word markup. TinyMCE is open-source and has LGPL and Commercial licenses available. We also created a custom a Sencha Architect user extension to support it, as well as bundled all of the source code into an Ext JS 4 “package” for easy deployment to your Sencha Cmd-based apps. // a url starting with "ionp"
And finally, we packaged everything (including the Sencha Architect plugin) into a Sencha package, which enables you to combine your component’s source code, related design assets, and (optionally) Sencha Architect plugin into neatly organized folder structure. Note that in the following screenshot, you can configure the TinyMCE editor plugins and other attributes by filling out a simple configuration form. Try out the component by clicking here. Download the full sourcecode and Architect User Extension from GitHub by clicking here. This entry was posted in Ext JS 4 on March 30, 2014 by sdrucker. That is pretty slick. Pretty slick. Thank you. Really helpful improvements on Oleg’s great work! I cant see that they belong to the editor or textarea. Are they something to do with the browser spell checker? Yeah, I should actually remove those. They’re for a language keyboard plugin that I developed for a customer that they haven’t released yet. Pingback: Integrating Ext JS 6, Sencha Architect 4, and TinyMCE | Druck-I.T. Defining Roles-based Security ACLs and Supporting Multitenancy in the Node.js Strongloop Loopback framework.